"Last Gingerbread House On The Left"
Forget Halloween: Christmas is the Belcher family’s preferred holiday for hanging out with possibly murderous weirdoes. 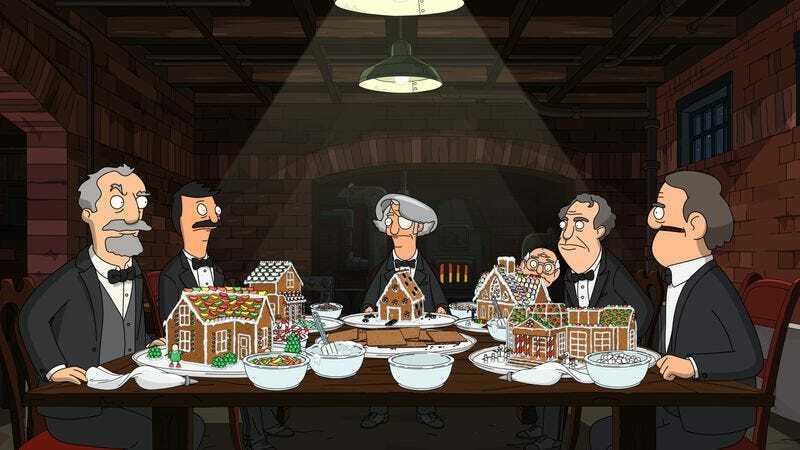 Tonight’s “Last Gingerbread House On The Left” builds on the tradition of the show’s first two Christmas episodes, “God Rest Ye Merry Gentle Mannequin” and “Christmas In The Car,” with a half-hour that takes the general festive spirit of the holidays as an excuse to get a little crazy, even by Bob’s Burgers standards. While those three Christmas episodes don’t all make precisely the same points, it’s possible to see the semblance of a common theme emerge, and it’s basically what Bob observes when he addresses his fellow builders of gingerbread houses. Christmas is a time for family and togetherness, and those who need those things the most are also liable to be the ones who feel the loneliness most painfully. That can take the form of a man who believes he’s a mannequin come to life, a driver of a candy cane truck who is prepared to kill the last car that crossed him, a bunch of rich loners who have nothing better to do than compete over the best gingerbread house, or a shut-in who doesn’t realize just how homicidal he appears to outsiders. No matter which of those we’re talking about—give or take the truck driver, considering he spent most of the episode legitimately trying to kill them—these are all people who find common cause with the Belchers. The Belchers are five incorrigible misfits who are just fortunate enough to all be related to one another, give or take the loveable hanger-on Teddy. It makes sense then that the Linda and the kids would be the right combination of impulsive, fearless, and kind of stupid to approach that terrifying house, even being willing to overlook any potential murderousness from its occupant upon finding out he has a beautiful singing voice and plenty of hot cocoa. The Belchers aren’t ones to judge, you know? And the actual setup for this side of the story is remarkably simple. Linda has one of her trademark big plans where the reality is never, ever going to match what she imagines will happen. Teddy is utterly incapable of not telling the kids about all the awful, disturbing rumors he’s heard about that house. The family learns their admittedly lackluster caroling isn’t appreciated. Their desperation leads them back to that one terrifying house, where Louise clearly wanted to spend all her time anyway. This is fundamentally a story that exists solely in the heads of Linda, the kids, and Teddy. Their singing isn’t worth much response and the odd man probably isn’t an actual murderer. (I can’t go beyond “probably,” since this is a show that has already given us Millie and Helen from “Housetrap.”) To some extent, this is a particular quirk of the show’s holiday episodes, which tend to come in very quick succession, thanks to Fox’s sports coverage compressing the Halloween, Thanksgiving, and Christmas episodes into such close proximity. These episodes use the festive spirit to get away with telling some of the show’s most outrageous stories, like the family weathering a killer turkey attack or Millie besieging the kids in their fort. But the show also uses the audience’s willingness to roll with these ridiculous stories to tease what are ultimately more mundane tales of the Belchers connecting with oddballs. Chett wasn’t really a mannequin, just as that house isn’t really the domain of a murderer, yet in both cases the kids’ yuletide-fueled willingness to believe makes both appear plausible, if only for a moment. All that said, there’s nothing imaginary about Bob’s side of the story, as he gets caught up with one of Mr. Fischoeder’s more harmless hobbies. This isn’t the first time we’ve seen Bob forced to humiliate himself in exchange for rent relief from his eyepatch-clad landlord—the similarly holiday-set “An Indecent Thanksgiving Proposal,” which ended with Bob being shot at, is probably the best comparison—though that familiarity isn’t necessarily a problem. After all, I’m not about to complain about the show giving Kevin Kline an opportunity to cut loose as he does here. Plus, this episode brings Bob and Mr. Fischoeder into more direct conflict than we’re used to seeing. There’s always a certain degree of anxiety when Bob throws away an opportunity to get out of a month’s rent, but here the trade-off is relatively sensible: Bob could use the extra money to get Christmas presents, or he could go for the big prize of getting his kids a cuddle session with an albino polar bear cub. Besides, this isn’t like the Thanksgiving episode, where one could plausibly make the case that Bob was staring at an excellent deal and just had to set aside his love of the holiday to see it. Here, Mr. Fischoeder treats him like dirt, and the landlord more than earns this act of revolt from his tenant. The actual resolution of the gingerbread house storyline might well outdo “An Indecent Thanksgiving Proposal” for the most over-the-top ending in the show’s history, even allowing for that time Bob and his friends had to fight a rampaging mechanical shark. 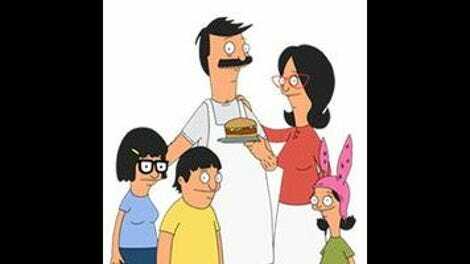 As animated shows go, Bob’s Burgers is generally realistic in the King Of The Hill mold, but it saves its most cartoonish elements for its depictions of the rich. As seen here, they’re an eclectic, eccentric lot, all prepared to start firing their hidden guns wildly at the first sign of trouble. Bob’s Burgers recognizes what a tightrope it’s walking once the guns come out, with Bob treating the whole thing as absurd right up to the moment they point their firearms at him, at which point he treats the matter with the seriousness it deserves. Maybe that willingness to kill over gingerbread houses just underscores the stupidity of the whole thing, or perhaps it goes back to the point Bob was making. These might be a bunch of maladjusted losers with infinitely more money than sense, but they still need something to believe in around the holidays. Since they’re all much too strange to see that in one another, investing far too much of themselves in their gingerbread creations will have to do. You know, now that he mentions it, Godfrey does seem like the fun one. Louise is officially prepared to have children… so long as she gets to feed them to this cub. Seems like a fair trade, honestly. Poor Felix Fischoeder. He’s more sane here than he’s ever been otherwise and he still gets shut out of all the fun. Sorry for this going up so late. Airing a new episode on a post-Thanksgiving travel day is a bit of a pain.